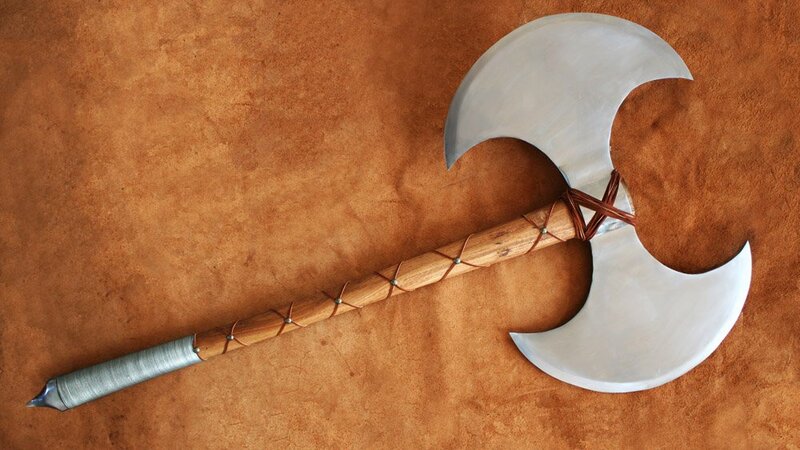 This massive axe is obviously not an historical piece, but rather a fun interpretation of what could only be described as a “barbarian” or “Executioner” axe. Weighing a total of 12 lbs ! 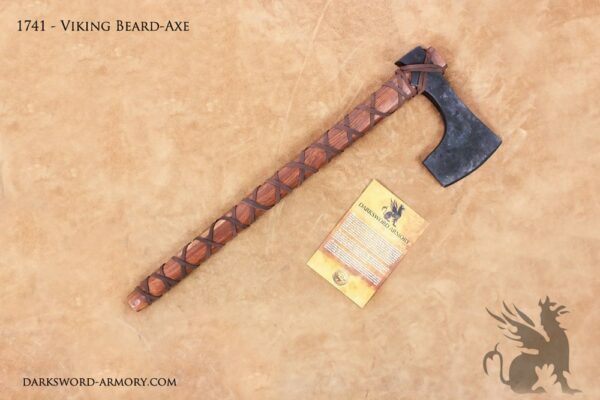 The axe is 48 inches long. The Barbarian Battle Axe began as a fun project after watching the animated film “How To Train your Dragon”. Astrid, the tough double headed axe wielding warrior from the Hairy Holligans tribe. 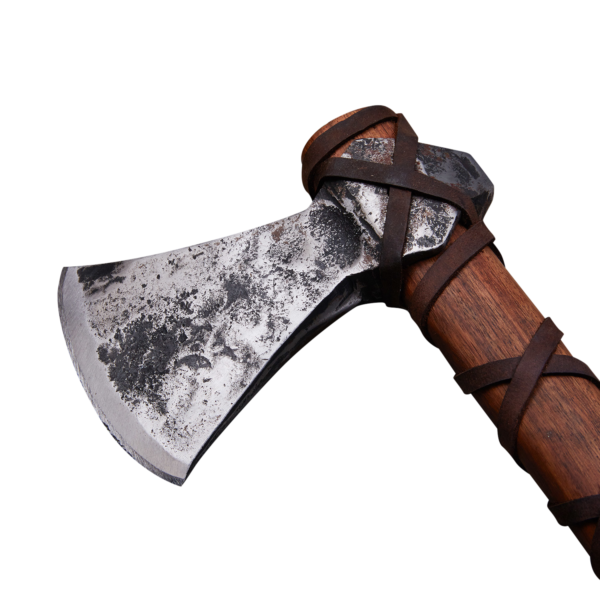 Astrid brandished the most striking axe of the movie, leading to the inspiration for the barbarian axe. This massive axe is obviously not an historical piece, but rather a fun interpretation of what could only be described as a “barbarian” or “Executioner” axe. Weighing a total of 12 lbs ! The axe is 48 inches long. The head is 24″ wide x 16″ high. 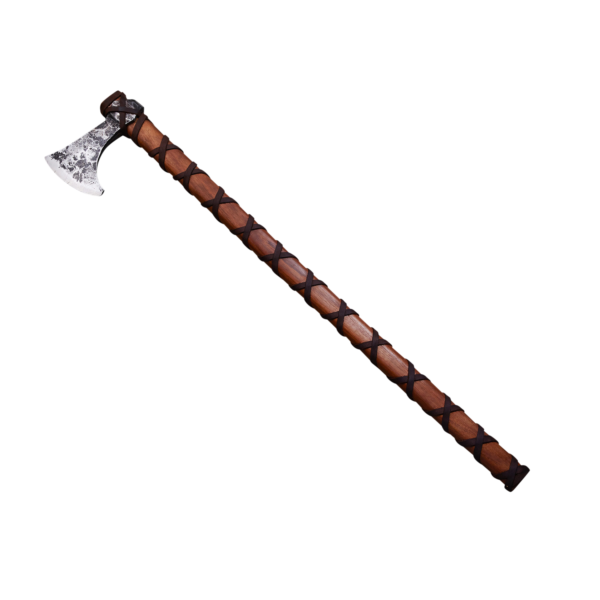 This striking piece can either be ordered dull or sharp for your beheading ! The orcs are coming. The heroes are surrounded. All hope seems lost – until with a mighty bellow, the barbarian warrior clears a path to safety with his improbably large axe. The day is saved thanks to the barbarian’s mighty thews, and his mightier axe. 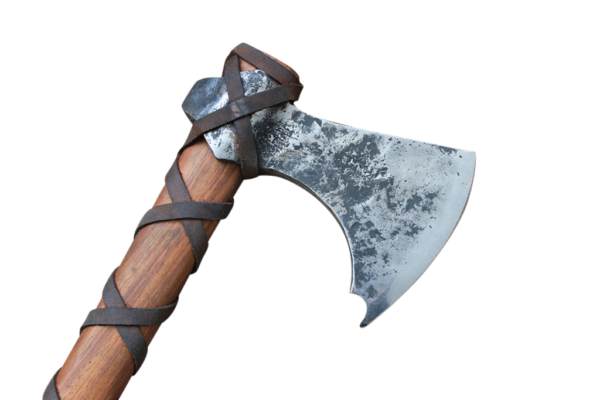 If the above scene sounds familiar to you, then you will probably also recognize this axe. In television, in movies, in video games and in tabletop RPG’s the fearsome barbarian reigns supreme. Often the party’s “tank” or damage-absorber, the barbarian is at the forefront of combat at all times – and often wields a weapon like this. 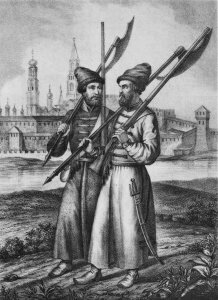 Two-headed axes were not common historically due to the fact that if your attack bounces off of an opponent’s armor it means an equally heavy and sharp axehead is probably headed straight back at you. 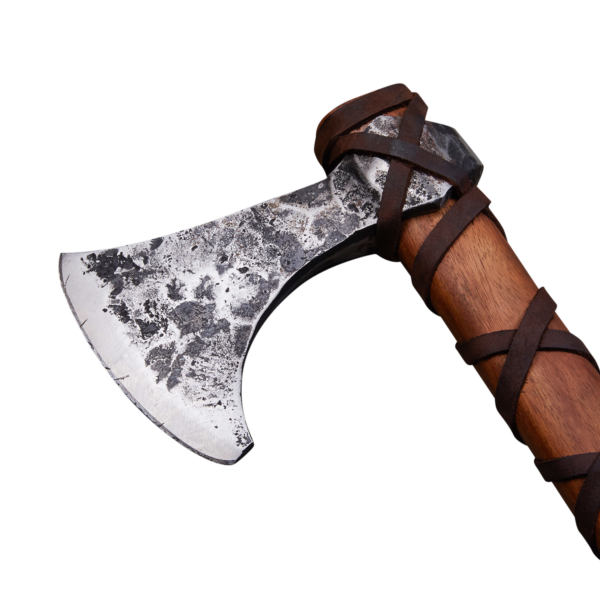 However, in fantasy many weapons that are impractical get a pass due to the “rule of cool.” The two-headed Barbarian fantasy axe is one such weapon. 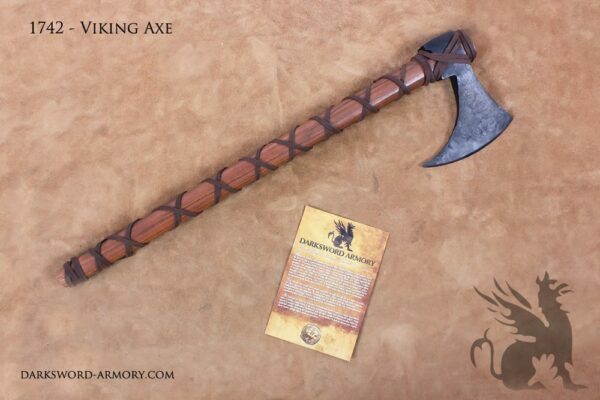 This axe is an incredible feat of smithwork and craft. Weighing a total of 12 lbs (! 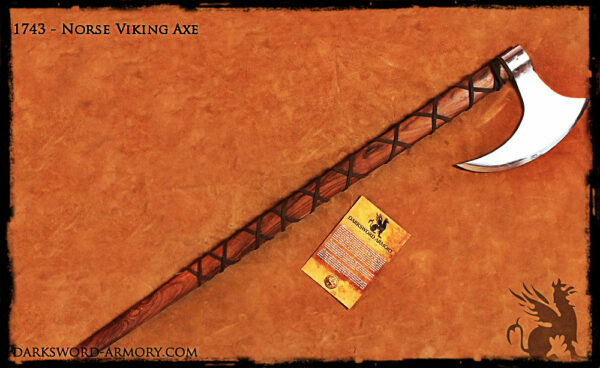 ), the axe is 48 inches long and has two equal sized, crescent-shaped heads. 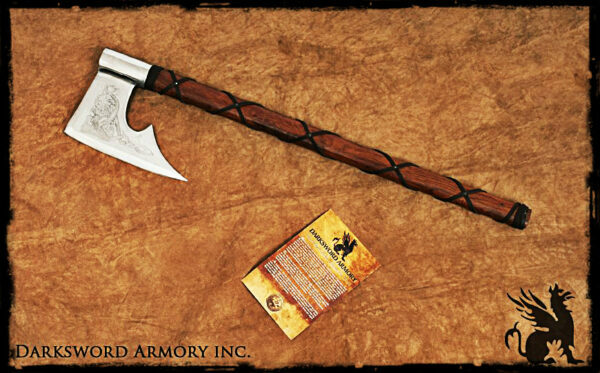 While we don’t recommend using it for combat, it is as battle-ready as every other product in our catalogue. 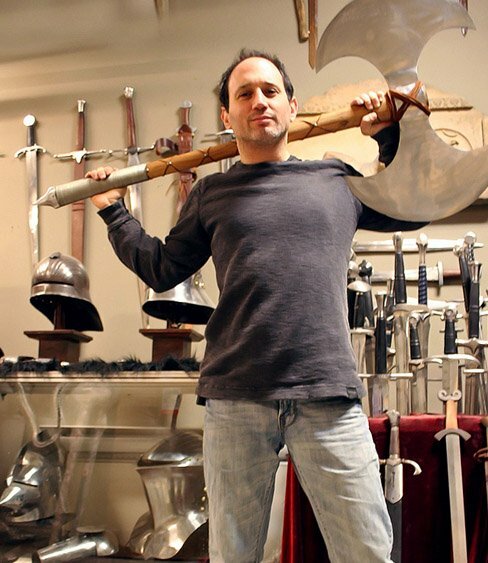 It would certainly turn heads at the renn faire or make an imposing centerpiece to your collection – assuming you can find hooks big enough to keep it on your wall. I received my Barbarian Fantasy battle axe yesterday. Needless to say I was very happy. It’s very big and very heavy ! The overall construction of the axe is very good. 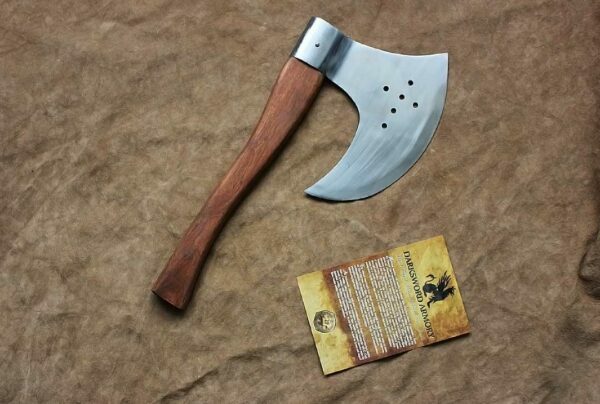 The only flaw I see is that the blade of the axe is curved. But maybe that’s how it’s supposed to be, I’m not sure. I am sure it would still function fine in a real battle. 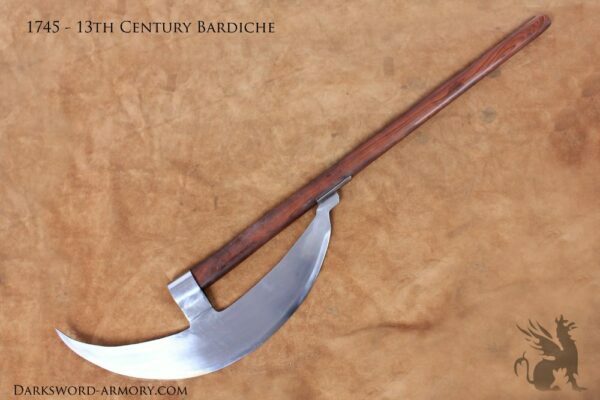 Because once you start the swing of this axe, it’s going to destroy it’s intended target. Thank you darksword.